A shop born from a project strongly linked to the territory. 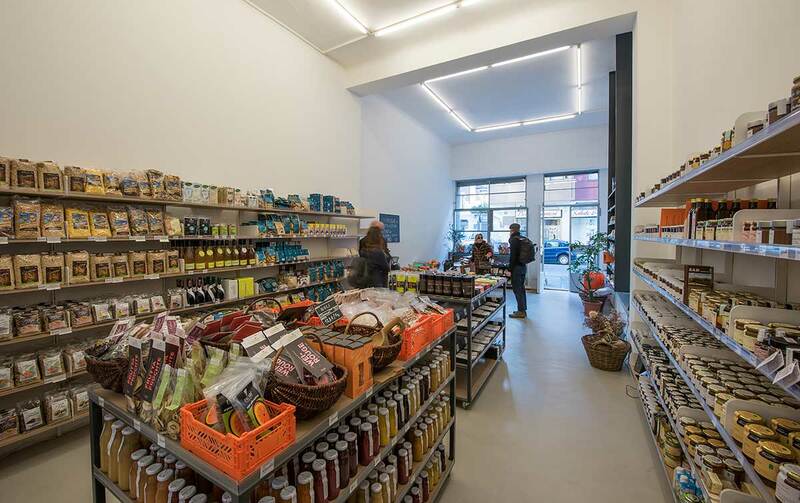 Although Terroir has recently opened in Milan, it has already become a reference point of the area (we are in Macedonio Melloni street) for what concerns natural food. Gabriele’s aim, instead, is to offer personally selected food, of which he knows the origin and, as far as possible, he is capable of having direct relationships with the producers. 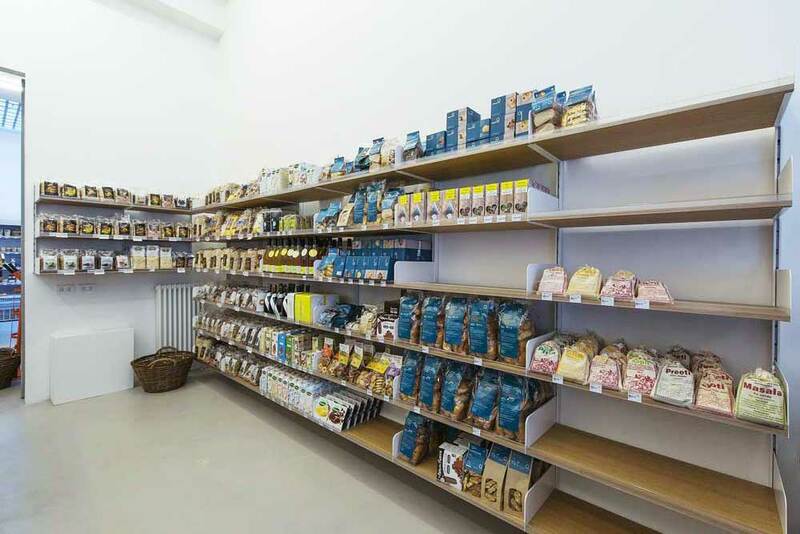 Everything is exposed at Terroir’s: chocolate, tea, biscuits, pasta, wines, fruit juices and then bread, fruit, vegetables and fresh cheese. Moreover, if you have curiosities, Gabriele is glad to tell you the origin, the characteristics, the aromas, the consistency of every product. “What criteria did you use to show products and create individual compartments? Have you decided on your own or have you relied on an expert? “I ask him. The flash that led the couple to make the final decision was the meeting at the Kriptonite showroom, where they went to ask for information about the K1 system. Here, Gabriele reflected himself, finding his own approach to customers, based on the willingness to listen and on the attention to individual needs. 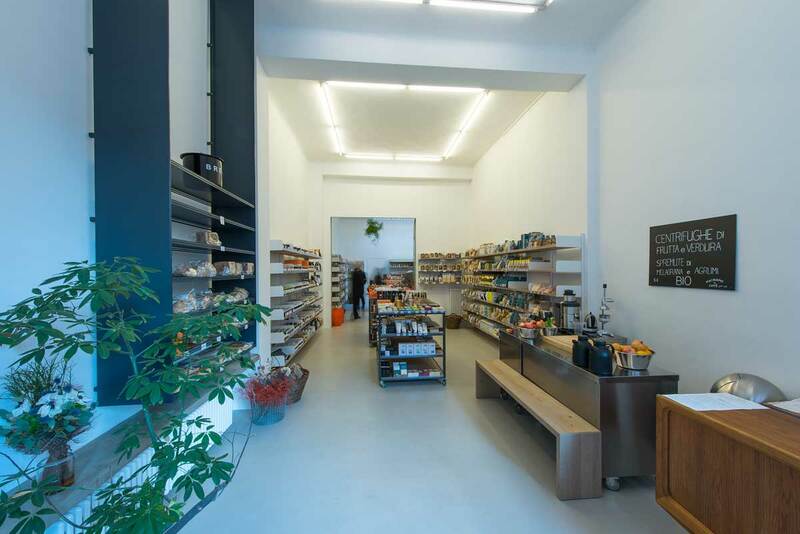 So now, along the walls of Terroir, there is the K1 system, in white aluminum with long oak wood shelves: the exposed products can be heavy, so it was decided to fix the uprights to the ground. 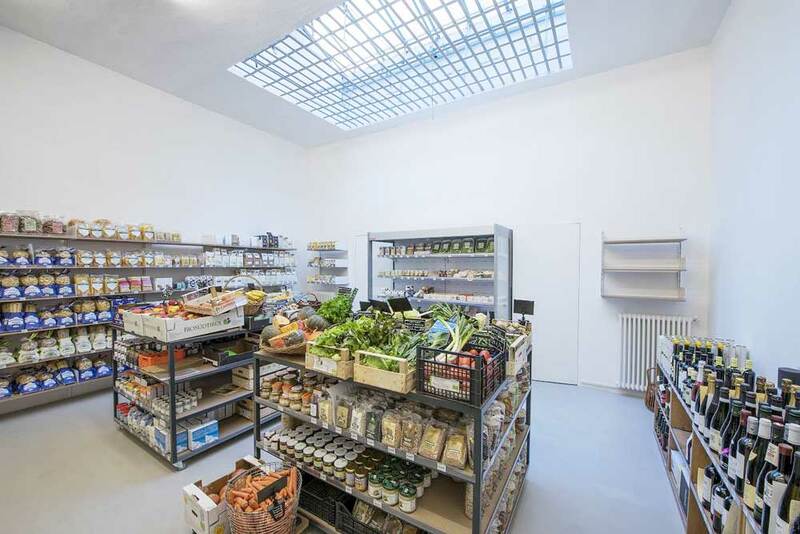 In the centre of the space, instead, Gabriele has organised iron islands, custom-made, for fresh fruit and vegetables, while the bread cabinet, with shelves, is in front of the tasting corner where you can savour tea and hot coffee or fresh and restoring centrifuges prepared at the moment. Gabriele’s professional career and his passion for the world of natural food have distant origins, since when, 12 years ago, he began working for the Botanical Center and sharing the philosophy of its founder, Angelo Naj Oleari. The most demanding part of the job, explains Gabriele, is the selection of producers and individual products, but it is also the one which makes his offer truly unique. At Terroir’s each product is sold with the addition of a small sheet explaining its origin and story.